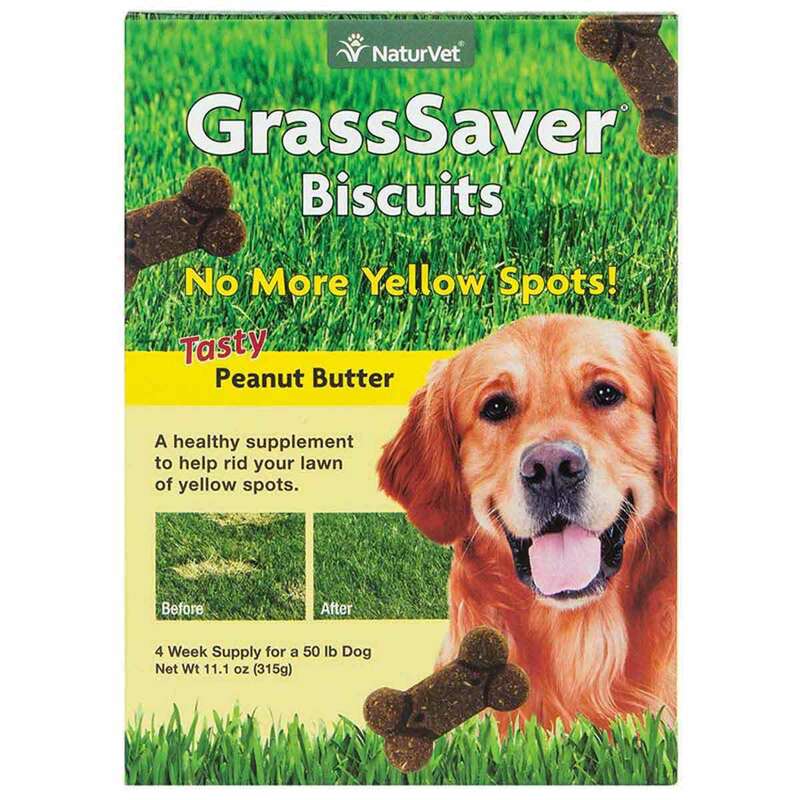 GrassSaver peanut butter flavored biscuits taste like a treat! A healthy supplement that helps to prevent your dog from yellowing the lawn. NaturVet uses a unique formula that contains a combination of B-Complex vitamins and amino acids. Under continued use, these treats help to lessen yellow spots. This product is offered as a biscuit, a soft chew, or as a wafer so you can choose whichever delivery form works best for you and your dog. Ground Brown Rice, Chicken Meal, Ground Barley, dl-Methionine, Psyllium Seed Husk, Vegetable Oil, Yucca schidigera Extract, Dried Carrots, Cane Molasses, Flaxseed Meal, Maltodextrin, Peanut Butter, Salt, Yeast Culture, Caramel, Fenugreek Seed, Yeast Extract, Zinc Proteinate, Manganese Proteinate, Copper Proteinate, Natural Flavoring, Turmeric, Choline Chloride, Zinc Sulfate, Vitamin E Supplement, Manganese Sulfate, Ferrous Sulfate, Copper Sulfate, Niacin Supplement, Vitamin A Supplement, d-Calcium Pantothenate, Sodium Selenite, Thiamine Mononitrate, Riboflavin Supplement, Pyridoxine Hydrochloride, Vitamin D3 Supplement, Biotin, Vitamin B12 Supplement, Calcium Iodate, Folic Acid, Mixed Tocopherols (a preservative), Rosemary Extract, and Citric Acid (a preservative).